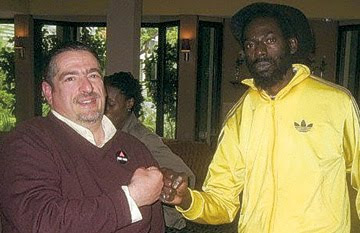 The Jamaica Forum for Lesbians, All-sexuals and Gays (J-FLAG) is "unimpressed" by Buju Banton's meeting with the San Francisco group, adding that the stalemate has further tarnished Jamaica's reputation. At the same time, J-FLAG said it doesn't want philanthropy but, rather, tolerance from Banton and other deejays. J-FLAG is not convinced that the meeting has produced any tangible results for the gay community that has been the target of the Banton's violent 1992 lyrics, sung a number of times in recent years as a mark of defiance against gay rights protesters,"
2. Repudiates the call for the "murder" of gay and lesbian Jamaicans. Banton said on a Wednesday night radio programme that gay murders in Jamaica are predominantly crimes of passion and not hate. "These are the minimum conditions required by decency for him to be absolved of his incitement of violence against these groups. Anything less is mere farce and a public relations stunt to garner support for his music," noted J-FLAG. This week, dancehall artiste Mark Myrie, aka Buju Banton, met gay rights activists in San Francisco, USA. The meeting was to discuss concerns of the gay community who have long protested his shows. Banton's international shows have been dogged by protesters and suffered cancellations since recording his 17-year-old, anti-gay song, Boom Bye Bye. The meeting's participants wanted Banton to give the proceeds from the song to J-FLAG, hold a pro-gay town hall meeting and sing pro-gay lyrics. Both Banton and J-FLAG dismissed all these requests. "J-FLAG is under no illusion that Mr Myrie or other DJs of his ilk will ever be minded to produce music that preaches the dignity of all life, including that of gays and lesbians. Neither do we expect contributions of any sort from them. In fact, such an engagement with the gay community is not our goal," said J-FLAG. "What we insist on, however, is that no one treats us as less deserving of the right to life than other Jamaicans by virtue of our sexual orientation." J-FLAG said that Jamaica's international reputation is marred by the continuation of this impasse. "We share the concern of the parties that the stalemate be brought to an end as soon as possible. Its persistence does harm to Jamaica's image and to the marketability of its popular music industry. It is for these reasons that J-FLAG is underwhelmed by a meeting that could serve to unfetter Mr Myrie's career but do little to redress anti-gay hostilities his music has fostered," said J-FLAG. The Jamaican society has not necessarily increased its tolerance towards homosexuals over the last five years according to J-FLAG. "We are constantly trying to assess the change in society but this is hard to judge as people continue to be attacked and harmed and even murdered just because of their sexuality. As regards the music industry, the music has been more suggestive rather than directly bashing gay people," said J-FLAG. *Hiss teet*, I never realise this was still an issue, look how much time I see them parading all over the place and NOBODY troubles them, the only time you hear about people hurting gays is when the GAYS start something first. I've seen them in "big bad" downtown areas parading in short shorts and mincing away merrily, and the most people do is point and whisper (I guess having a gunman boyfriend helps). In the most cases where they actually die, is some jealous lover (or someone else's jealous lover) do it. I agree with Banton's statement about it being a crime of passion and not hate. Boom Bye Bye till the next blog.